Even now that he is safe in Europe, Mohammad Harb often finds himself back in his Syrian prison cell. The screams of prisoners echo in his memory. The lifeless bodies of tortured detainees appear in his dreams. Scars, from when the guards burned him with lit cigarettes and beat him with a rubber pipe, line his back and legs. 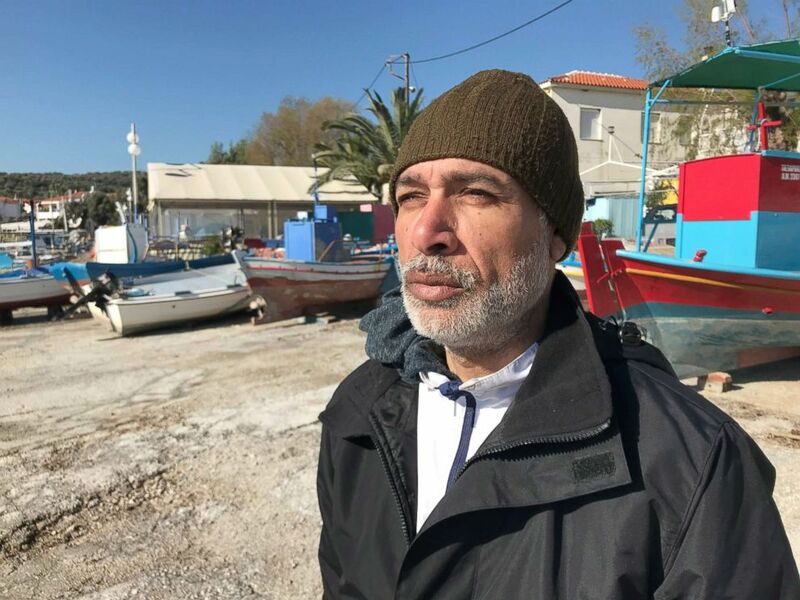 Like thousands of others who have fled from danger or mistreatment, Harb, 49, is now trapped on the island of Lesbos, waiting to find out if he will be granted asylum. After years of war and the perils of the escape, many of the refugees and migrants waiting on the Greek islands now have to cope with their psychological trauma. The demand for mental treatment is so great that aid organizations struggle to keep up. “We’re seeing a huge increase in psychiatric cases that we have to deal with,” Grigoris Kavarnos, a clinical psychologist who treats refugees and migrants on Lesbos with Doctors Without Borders (MSF), told ABC News during a recent interview. MSF had to stop taking new patients recently because its mental health clinic had reached full capacity, with hundreds already on the waiting list, Kavarnos said. Some of the patients, many of whom are victims of sexual assault or torture, were unable to even be in the clinic’s waiting room because it was so overcrowded, he said. In response to the high demand, MSF opened a larger clinic in early March, which has allowed them to take new patients again. The organization works with local psychiatrists, but has now also employed a full-time psychiatrist because of the increase in patients who suffer from psychiatric problems such as severe anxiety and depression, Kavarnos said. Mohammad Harb, a Palestinian from Syria, lives in a small tent in an olive grove, which serves as an informal refugee camp on the Greek island of Lesbos. Many patients develop psychiatric conditions because they not only suffered in their home country, but also as they were fleeing and now while they await an answer to their asylum claims on the Greek islands. “If a person has left the country because, for example, they were jailed and tortured and then during their journey they get mistreated by smugglers or the authorities in the countries of transit and then they’re forced to live under conditions reminiscent of jails here in Greece, under really shocking conditions; you can imagine that by the time they come to me for help their condition is completely awful,” Kavarnos said. The majority of the patients he treats suffers from post-traumatic stress, he said. The symptoms can be anxiety, nightmares, lack of sleep -- and when they get worse: deep depression and hallucinations. Some 300 migrants and refugees live in tents in an olive grove outside of the Moria camp on the Greek island of Lesbos. Harb lives in a small tent in an olive grove, which serves as an informal refugee camp right outside the Moria camp, the largest on the Greek island of Lesbos. When he was in prison in Syria, he and 50 others slept crammed together in a tiny cell, he said. He had 10 seconds to go to the bathroom once a day. Every 16 hours, the guards would bring them a piece of bread or maybe some rice to eat, he said. His past experience means that he is now unable to live inside the Moria refugee camp, which is so overcrowded that many have to share tents with strangers, separated only by pieces of fabric. Instead, Harb chose to stay in his own small tent outside the camp among the olive trees. He doesn’t know how long he'll be there. The trauma of his past combined with the uncertainty of his present triggers very different reactions -- sometimes he’s extremely apathetic, other times overly emotional, he said. A group of men from Yemen lives in a cluster of tents near Harb’s tent. One of them is Khaled, a 30-year-old gay man from Aden who like Harb said his anxiety doesn’t allow him to live inside the Moria camp or share his tent with others. Instead, he bought his own tent for 100 Euros, he said. In June, Khaled was at the beach in his hometown with a close friend who is also gay. While Khaled went to buy ice cream, masked men drove by and shot his friend to death, he said. Khaled said he witnessed what happened. Khaled said he believes his friend was killed by extremists who deliberately targeted gay people in Yemen. After his friend died, Khaled received death threats, he said. One day he found a bag placed on his car. Inside was a bullet and a note that read: “You’ll be next.” That’s when he decided to escape his country. In late October, he was smuggled to Oman, then traveled to Iran where he made several stops before making his way to Turkey. From there, he and about 50 others had to stand in a van that drove them for 15 hours before they boarded a boat to Lesbos in December. Now, he still doesn’t feel safe or comfortable, he said. He sleeps on wood and gets cold at night. When it’s very windy, his tent collapses. He also feels frightened, especially at night. Sometimes he doesn’t get any rest for days, he said. Across the street from his tent is the Moria refugee camp. The words “Welcome to prison” are spray-painted at the entrance and barbed wire surrounds the camp, which used to be a detention center for rejected asylum-seekers. People there live in shared tents and containers that are packed tightly together. Majdolin, 27, and her parents live in one of the containers, which they share with a few other families. Their living space has just enough room for three sleeping mats that are placed right next to each other. 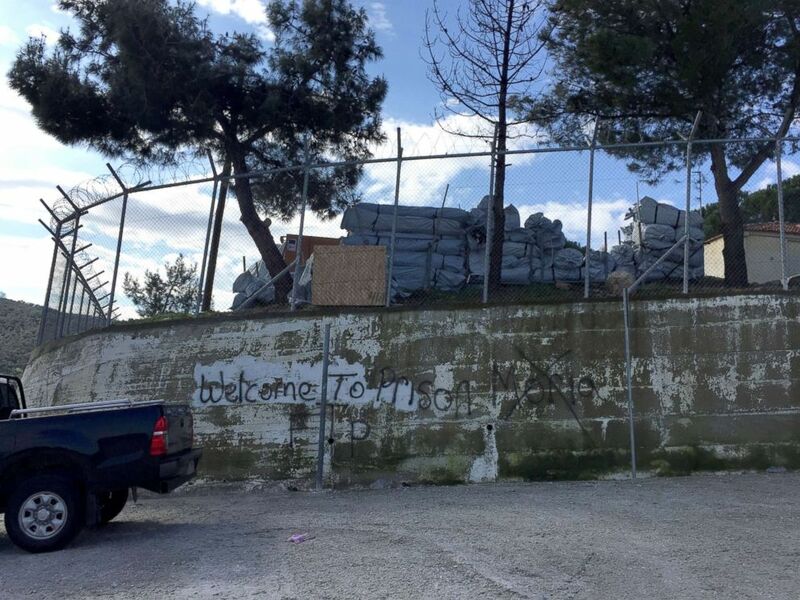 The words "Welcome to Prison" are spray-painted on the wall that surrounds the Moria refugee camp on the Greek island of Lesbos. The family escaped from Aleppo in war-torn Syria. Majdolin said she still has nightmares about the fighting she witnessed there. Sometimes she dreams that bombs are falling on her and wakes up terrified. Her parents are sick. They have been given permission to await an answer to their asylum application in better conditions in Athens. But Majdolin keeps being told by the authorities that she has to wait in the camp. And her parents don’t want to leave her alone -- so they have stayed behind too. The family has been waiting in the camp since September, they said. Under the EU-Turkey agreement, which has been criticized by humanitarian organizations, refugees and migrants who manage to cross the sea to Greece are trapped on the islands. They face being returned to Turkey, unless the Greek authorities determine that they should be granted asylum in Greece. 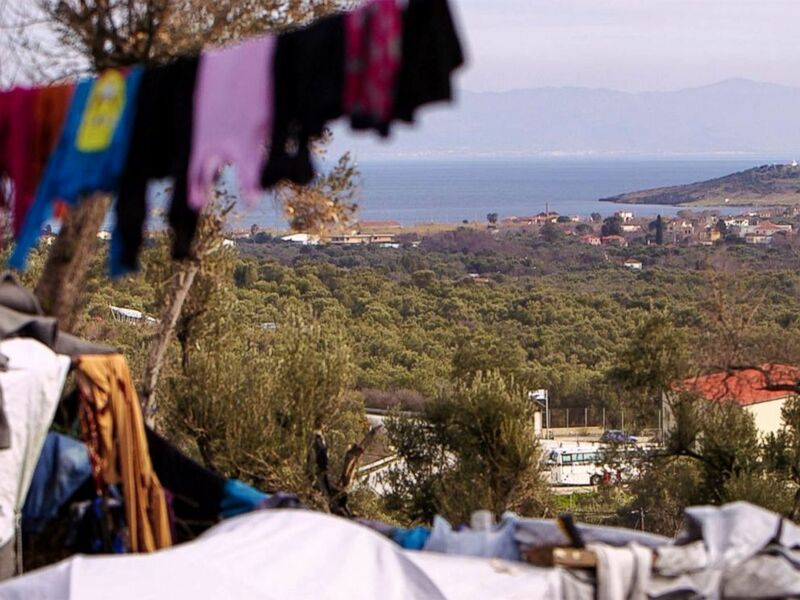 Only vulnerable asylum-seekers such as pregnant women, unaccompanied children and torture victims -- or asylum-seekers with close family members elsewhere in Europe -- are allowed to move to mainland Greece. But even those vulnerable people often have to wait on the islands for months for a decision. Majdolin, 27, says she has attempted suicide several times while awaiting an answer to her asylum application on the Greek island of Lesbos. The most difficult part about living in the camp is the lack of safety, the dirt and the uncertainty, said Majdolin. The bathrooms in the Moria camp are not only dirty but also unsafe. Last month, the United Nations Refugee Agency (UNHCR) said that reports of sexual assault in the Moria camp are high and that bathrooms and latrines there are no-go zones after dark for women and children, unless they are accompanied. Even showering during the day can be dangerous, the UNHCR said. Giannis Balpakakis, the Moria camp’s director, said his staff struggles to keep up with the amount of people arriving on the island. The camp is so crowded that staff members clean the bathrooms and toilets only to find them dirty again an hour later, he said. 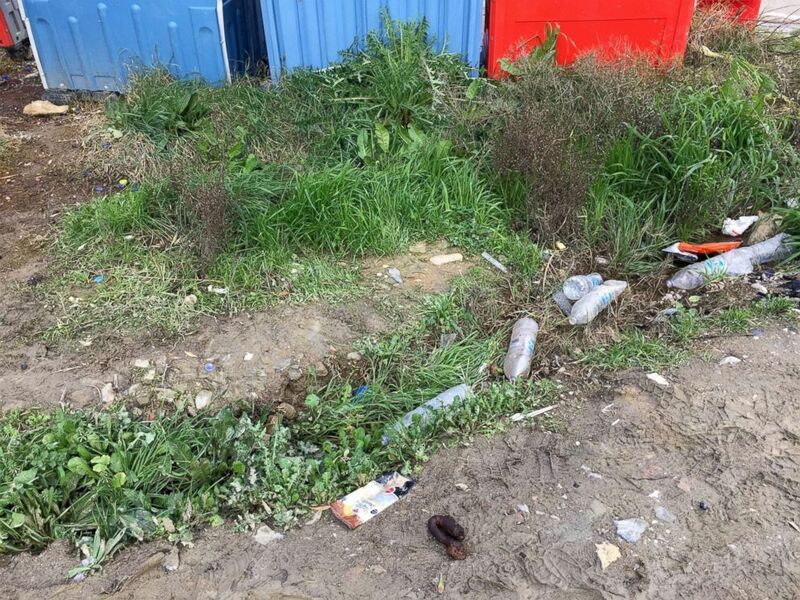 Plastic bottles and human faeces are scattered around the Moria refugee camp on the Greek island of Lesbos. Majdolin said that during her stay in the Moria camp her mental health has deteriorated. She feels sad and angry and often gets into fights with her parents over small things. She has attempted suicide several times, she said. “It got to that point,” she said. 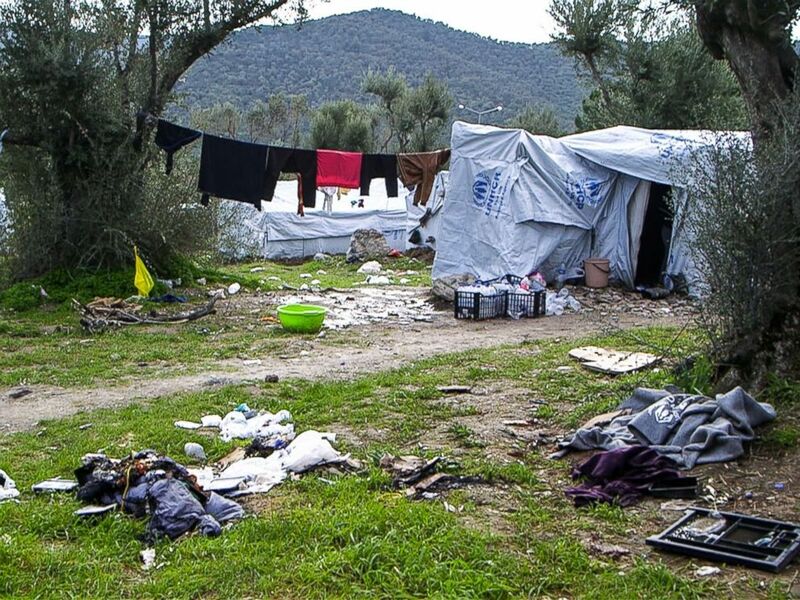 Kavarnos, MSF’s psychologist on Lesbos, said that even healthy people who haven’t escaped from war or mistreatment will develop psychological problems if they stay in the Moria camp for just one month. “And if you’re kept for two or three months and are left untreated, you will develop psychiatric problems,” he said. Majdolin said she has made friends with some of the other young women who live in her container, but they have gotten permission to move to Athens and will be leaving soon. Many of the friendships she makes are temporary because people move on. Before the Syrian war, Majdolin worked as a hairdresser and dreamt about taking an education. Now she hopes to reunite with her two sisters and brother who live in Austria. But it is difficult to think about the future while she's waiting in the camp, she said.